A prominent official of the National Electoral Commission of Tanzania said more than 140 international poll observer missions are in the country to monitor the upcoming October 25 presidential, parliamentary and local elections. Emanuel Kawishe, director of the legal services department of the Electoral Commission, also said political parties have met all legal requirements necessary to allow them to campaign and be part of the upcoming vote. Tanzania has 22 registered parties under the Political Parties Act of 1992. “All the political parties which are participating in the elections rallies, they all met the criteria, all the legal requirements because before they are nominated to run for any post, they have to fulfil the legal requirements. So, to say if you see a candidate is there in the rally, then it means that he has met the criteria required,” said Kawishe. Supporters cheer during a campaign meeting delivered by former Tanzania's Prime minister and presidential candidate Edward Lowassa in Dar es Salaam, Oct. 1, 2015. 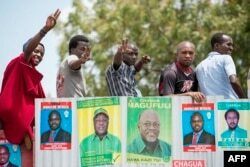 His comments came after the electoral commission officials briefed representatives of the poll monitoring groups at a meeting in the commercial capital, Dar es Salaam. Kawishe said the meeting with the poll observers was productive. He said the meeting was part of the electoral commission’s bid to ensure a smooth working relationship with the observers as they prepared to monitor the elections. Kawishe said the electoral officials briefed the observers about Tanzania’s history, before and after independence, how the electoral commission was established to meet a constitutional requirements, and the country’s electoral process. Tanzania’s constitution provides for the independence of the National Electoral Commission, without interference or directive from the government. Kawishe said the electoral body also briefed the observers about the commission’s readiness to administer the upcoming vote. Kawishe said the electoral commission would be swift, but cautious in announcing the outcome of the election results. He said the electoral body was implementing measures to ensure the elections were peaceful and credible Kawishe outlined plans the electoral commission would undertake to announce the results. “For the ward councilors we expect to announce the same day, at least by evening. ... Also in the constituencies, members of parliament, depending on the geographical location, also they would be announced the same day at least 25th to 26th the winners would be declared.And for the presidential election, we expect to announce the winner at least within three days if all goes well,” said Kawishe.